"World astrology deals with global resonance about the destiny of human beings and nations, allowing us to realize how dependent we are on each other, but also that we can be united on this beautiful blue planet." 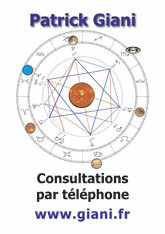 In World astrology as in native chart, the square aspect is considered as problematic. 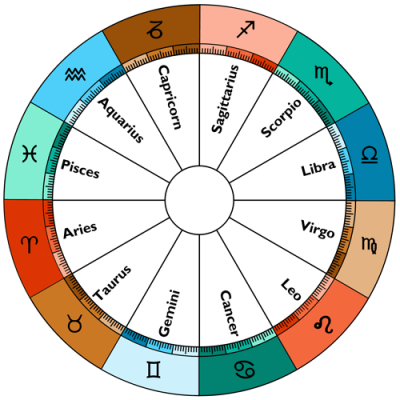 Of all the aspects formed by slow planets to planets in the birth chart, the square is with the conjunction, the most complicated one to control, the one that poses a majority of problems. In order to have a better understanding of the reasons why it reveals to be problematic and even conflicting, it is essential to recall the process by which a planet is able to form a 90° angle with another planet, may it be in the birth chart like in the transit. The lunar month, the most accelerated process of the celestial movements in our solar system, enlightens us on this point. 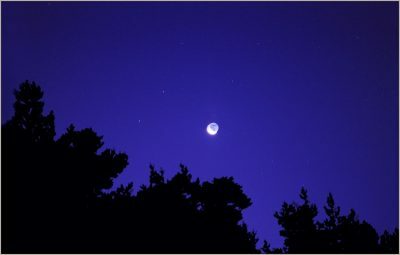 In fact, from the new Moon (Sun-Moon conjunction) to the full Moon (opposition), we inevitably pass by the first quarter (crescent Moon) and from this full Moon to the following lunar month, by the last quarter (waning Moon). 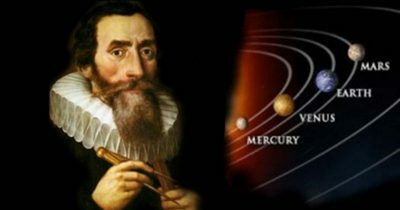 Therefore, the two quarters corresponding to squares between the Sun and the Moon, we notice that these aspects are integral part of all planetary process. They appear to be of as much importance as the two major phases of the cycle, the conjunction and the opposition, by forming in turn a half-point opposition. If we draw a straight line from any point to its opposite on a circle, i.e. from one conjunction point to its opposite, we divide this circle into two equal parts. If from their respective half-points we draw another straight line, we obtain a circle divided into four equal parts. Standing out on the circle we see a cross, esoteric symbol of terrestrial incarnation, of our three dimensional universe. This geometrical figure is essential and fundamentally explains the necessity of the square. Let one divide again this same circle into twelve equal parts – the zodiac – or, into eight parts such as in certain african or tibetan traditions amongst others : the geometrical figure of the circle along with these four parts form the basis of every principle applied within our solar system, within our Earth. 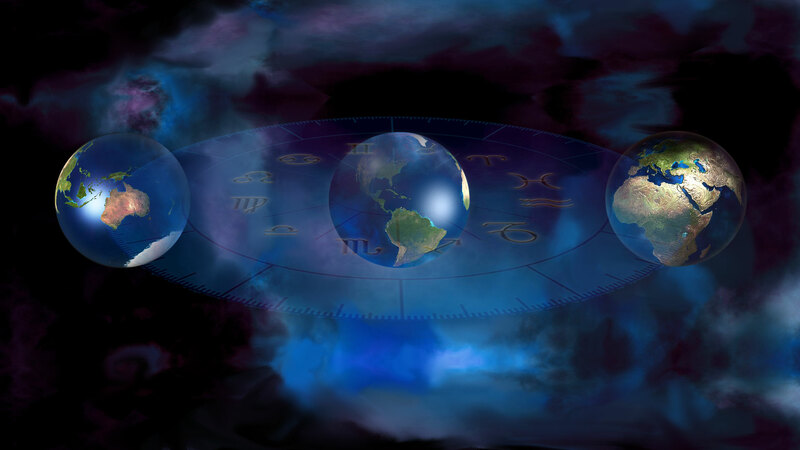 The four elements (Fire, Earth, Air and Water) in a three dimensional universe (the three crosses : cardinal, fixed and mutable), constitute the essential principles of the zodiac and allow us to have a better understanding of how the square operates. In order to better comprehend which nature is the forming square in transit and what forces it depends on, it is useful to know on which of the three crosses it will operate. – Does it operate on the cardinal cross 1 ? In this case, it will globally concern a decisive event affecting social destiny, a new start from whichever level may it be. The square will trigger off a new way of seeing and handling things by making them, willy-nilly, suddenly evolve. – Does it occur on the fixed cross 2 ? Here, it will more directly touch an individual’s vitality and personal values. The change will operate in a slower fashion than on the cardinal cross, by fits and starts because it will no doubt engage the individual in a stronger way. – Does it operate on the mutable cross 3 ? This cross is fully ready to bring itself into question and in this context, the square can positively transform the energies at stake. One only needs to leave the planetary energies operate without blocking them with ones ego or ones mental. 3 Ending season signs : Gemini, Virgo, Sagittarius and Pisces. – nothing moves without the mutable cross. However, we repeat, these global indications are to be put back into the context of the birth chart and of the natives true possibilities. Nothing speaks out the most than the Zodiac itself in order to seize how the planetary energies distribute themselves and what connections link them together. The sign/ruler synthesis into square informs us on the problem in question : thus, the sign of Aries squared to the sign of Capricorn has a problem with its ruler, Saturn. The Aries sign often loses the notion of time. It lacks patience and reflection : its impulsiveness makes it start out all sorts of things for which it seldom sees through a conclusion. It also lacks of structures : the Aries sign has difficulty to materialize most of its actions. It very badly organizes itself and is short of logic. By way of the square, Saturn asks the Aries to proceed by stages and to consolidate undertaken initiatives by moderating the interior fire that leads it to ignore all laws. Let’s take the following sign, the Taurus : this Earth sign has a problem with Uranus, the ruler of Aquarius with whom it is in square. Actually, the Taurus sign quite dislikes changes. Rooted in its personal convictions and to the rhythm of life it imposes itself to, the Taurus hates to be pushed around. It lacks of open-mindedness towards innovative ideas and has difficulties to reappraise certain personal values. By way of the square to Aquarius, Uranus requests the Taurus sign to come out of its routine, to stop being contented by facile pleasures that reassure, but also ossify. It forces the Taurus to move, to take into consideration advices coming from people who are close, to take a look on new facts offered by the future, even if this is disturbing for a while. 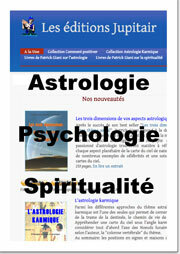 The following sign, Gemini, has a problem with Neptune, ruler of Pisces with whom it is squared. It is too much contented by superficial, if not illusive ideas and thoughts. Moreover, (compared to the other signs) its lacks of faith and ideals. The Cancer sign has a problem with Mars, the ruler of Aries : difficult for the Cancer to take initiatives, to stand up alone to adversity. 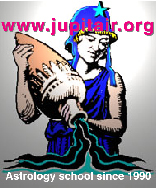 Likewise, we can go on, sign by sign up to Pisces, the latter having problems with Jupiter, ruler of Sagittarius. The Pisces sign lacks enthusiasm and its expansion possibilities remain limited. We hence notice, by the three cross set and the signs squared amidst these crosses that this square aspect, of which some fear an expiry limit, is in fact a motivator, a launcher, a necessary aspect to all evolutionary process. 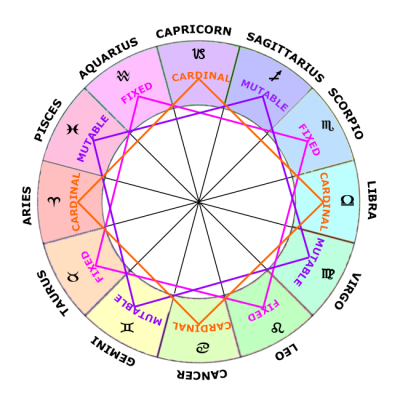 Without squares, there would not be much going on in our birth charts ! Only conjunctions and oppositions would move around our personal planets.